Although frontier markets are a small subset of the emerging market universe, we think they represent an important constituency that offer some compelling potential opportunities. Here, I’ve invited my colleague Carlos Hardenberg, senior vice president and director of frontier markets strategies at Templeton Emerging Markets Group, to outline some of the opportunities he sees in these dynamic markets and debunk some of the urban myths. There are a number of urban myths about frontier markets (the less-developed subset of the emerging-market universe). We think these myths may have caused investors to overlook them in favour of developed or traditional emerging-market alternatives. We believe conditions are now ripe for a re-evaluation of this important niche. There are some very compelling reasons why many investors might want to take another look at frontier markets today. These can be summed up as the following, which I will delve into further. But first, let’s address those urban myths about frontier markets. The most persistent are perceived illiquidity, small market capitalisation and poorer corporate governance standards. Each of those accusations might be true if one looks just at a narrow selection of markets, but looking at the global opportunity of the frontier space, as we do, provides a better context in our view. While index providers differ in what each regards as a frontier market, we don’t adhere to those definitions or constraints. This gives us more flexibility to explore opportunities beyond a particular benchmark, and avoid some of those limitations. We view frontier markets more broadly as young or new markets in an earlier stage of economic development than larger emerging markets, generally with higher growth rates, less research coverage and a lesser degree of foreign investment. According to our analysis, the daily turnover traded on stock exchanges in frontier markets is US$2.1 billion every day. So it’s more liquid than many people think. Equally, we estimate the total market cap of frontier companies is $1.7 trillion. Because new companies are constantly coming to market, we’d expect that figure to continue to increase. When it comes to concerns about corporate governance in frontier markets, we’d champion what we consider the positive influence of active management. Looking back at the development of emerging markets in general over recent decades, the relationship between ownership and management has been an important one. We believe most of the positive change came because of the close collaboration between shareholders and the businesses, and the constant feedback both ways. This is not something that can typically be achieved through a passive investing approach. If you have a computer program directing investment decisions or an algorithm determining the weighting of shares, it raises the question of who is going to interact with management and who is going to vote at shareholder meetings on matters of corporate governance. We think that is particularly important when one is considering frontier markets. Let’s turn now to the reasons that we think frontier markets pose an interesting potential opportunity for investors today. 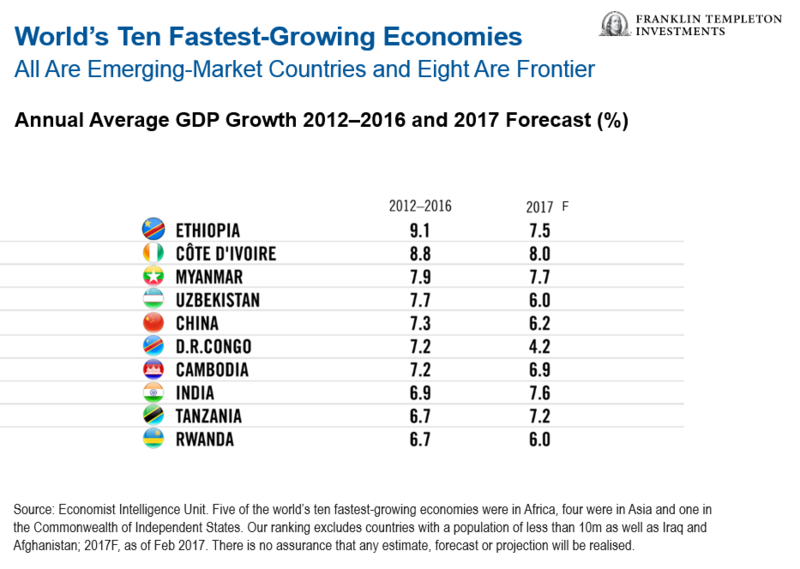 It shouldn’t come as a surprise to many investors that the 10 fastest-growing economies in the world today fall under the emerging markets banner. But what they might not have expected is that once one strips out China and India, the remaining eight fastest-growers are actually frontier markets. There are economic and demographic reasons why we see that trend of fast growth likely to continue. These include a low median population age, increasing urbanisation in frontier markets compared with emerging and developed counterparts, and low but growing per-capita income. Our optimism about the opportunities frontier markets present is underpinned by the evidence we have seen of a real reform agenda across many of them—in marked contrast to the developed world. In the developed world, notably in the United States and Europe, we are seeing signs of a move towards trade restrictions and isolationism that we consider backward economic developments. Meanwhile generally in frontier markets and some emerging markets, we have seen evidence of a quiet but pronounced reform effort taking place. The trajectory of commodity prices has played a part. In the so-called boom years of 2000–2008, when commodity prices were doing well, there was little impetus for reform, especially in those countries that relied on commodity exports. But when the big shock came and commodity prices corrected dramatically, a lot of these countries needed to go back to the drawing board and back to reforms to attract capital to finance development. At the end of the day, in order to attract capital, countries—especially frontier markets—need to show the world they can enact reforms. Argentina is a great example of that. After Mauricio Macri was elected president in December 2015 under the banner of a “Let’s Change” slogan, he implemented a number of reforms including lifting currency controls and settling a decade-long lawsuit that had blocked Argentina from international capital markets. As a result of those reforms, Argentina was again able to access the international capital markets. In April 2016, it launched a US$16.5 billion government bond. Egypt is now going through a similar experience. It floated its currency and subsequently secured a US$12 billion loan from the International Monetary Fund. These examples show us that reform efforts can translate into economic activity. When we talk about the attractiveness of frontier-market investing, the single most important factor for many investors tends to be valuations. 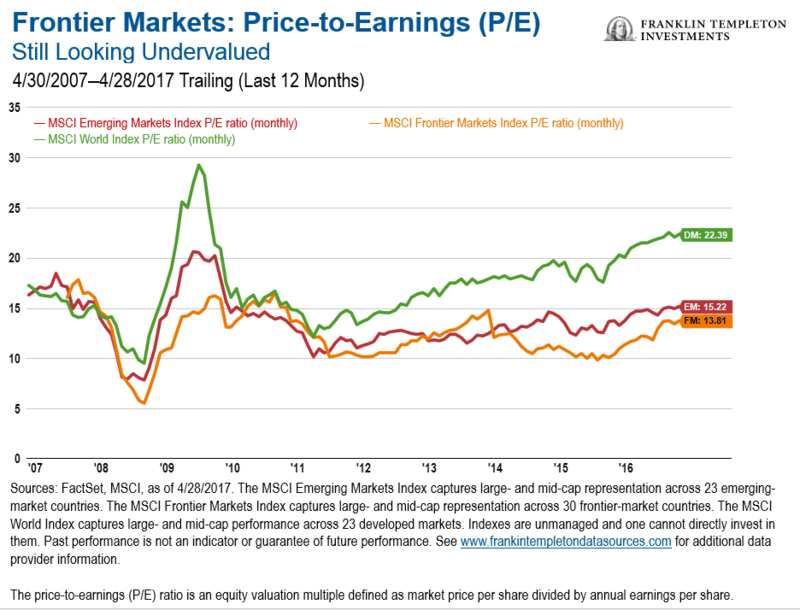 Currently, frontier market equities are trading at what we consider very cheap valuations compared with both developed and emerging market peers, as the first chart below shows. At the same time, as an asset class frontier markets have traditionally had very little correlation1 with emerging markets such as China, Brazil or Indonesia, or with developed markets including the United States, Japan or the United Kingdom. As with emerging markets in general, there may be a tendency among the uninitiated to lump all frontier markets under the same umbrella. We think that’s a mistake. We believe this “umbrella” approach is even more misguided for frontier markets than for emerging markets. To our eyes, the diversity between these countries is striking. For example, Vietnam is completely different from the Ivory Coast, which in turn is different from Nigeria, which is different from Romania. 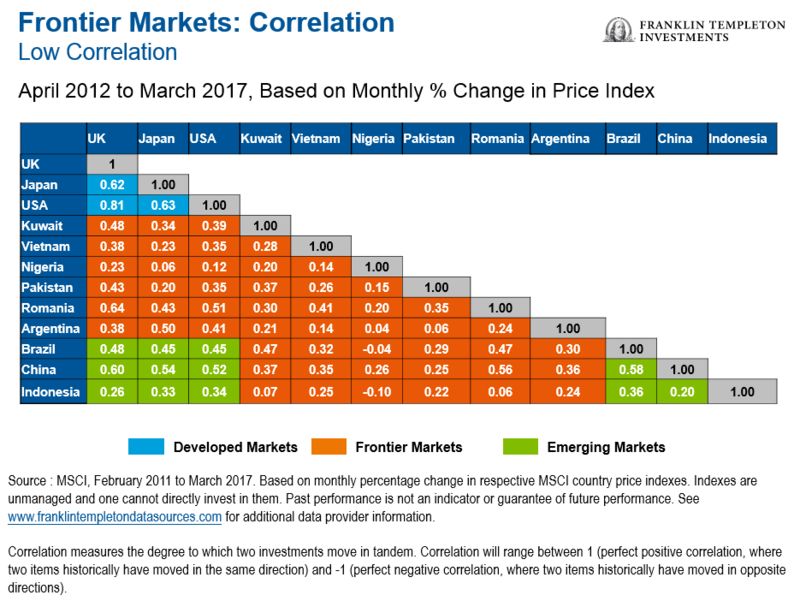 Indeed, frontier markets are more different from each other than the emerging markets are in many ways. That provides challenges and opportunities. But overall, our expectation is that the kind of reforms we’re seeing now in frontier markets are a perfect feeding ground for improvements in turnover and size—and for more opportunities for equity investors ahead in this dynamic space. 1. Correlation measures the degree to which two investments move in tandem. Correlation will range between 1 (perfect positive correlation, where two items historically have moved in the same direction) and -1 (perfect negative correlation, where two items historically have moved in opposite directions).